The phrase “living legend” gets tossed around a lot but there is no better way to describe Ernie Baur, long-time D.C. news and sports director and producer. 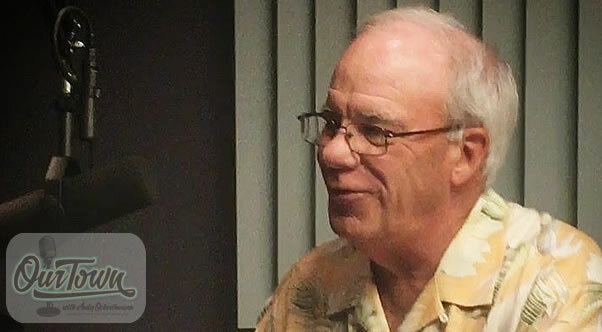 In this fun and story-filled interview, Andy O. and the 14-time Emmy winning reminisce about the go-go years of local television programming and the diverse personalities that made it so special. Born and raised in a Bethesda that has long-since faded from memory among the concrete and steel buildings of today, Ernie attended our Lady of Lourdes until 8th grade. In 9th, grade Ernie attended Good Counsel (hitchhiking to and from the all-boys Catholic school), and ultimately graduated from the co-ed high school right behind his house, Bethesda Chevy Chase. Deciding that more school was not for him (“I went to Montgomery College for about an hour and a half”), Ernie Baur was grilling steaks at the local Bonanza when his first break in broadcasting came as a part time copy boy at Channel 9. His prowess on the football field playing with the station crew team in the local flag football beer league game earned him an invitation for a paid internship. This would be just the beginning of the important role football would play in his life and career. But it wasn’t just on the news broadcasts where Ernie learned his craft. As stage manager of the Saturday morning Ranger Hal show “I used to run the puppets, Hal did the voices. You get behind the screen and you put your hand up you’re Marvin Monkey, Dr. Fox, Oswald Rabbit.” And, of course, Ernie has a story or two about trying to do the show after a few late nights at The Dancing Crab. While brief, Ernie Baur got his first directing break at Channel 7, working with another DC broadcasting legend Ed Walker on AM Washington, pairing Walker with Ruth Hudgens. But Channel 9 wanted him back and they sent a very special envoy to recruit him. “Fortunately for me…the person that they hired to replace me was awful, so awful to the point that they came back to me and they had Gordon Peterson take me out and say we need to get him back. Jim Snyder was a news director Ben Schneider and John Baker was a producer they’re the ones that said ‘Look we gotta get Ernie back okay and whatever it takes and so Gordon got me back.” And it was at Channel 9 the Ernie met Lucille, his wife of 43 years. Glenn Brenner, the quick-witted and beloved sportscaster started out as the “third-string” sports anchor on Channel 9 but within a year was the “guy.” And, the rest is history. As the “Warner Wolf Show” morphed into “Redskins Sidelines” once Wolf had left the station. Once Sonny Jurgensen joined “Sidelines”, the format was set and its popularity grew among Redskins fans. After more than 50 years in the business, Ernie Baur has an established place in Washington, D.C. broadcasting history. From his early days working kids’ shows and Sunday morning community broadcasts (“Mass for Shut-Ins” and “The Jewish Hour (really a half-hour)”) to directing the news at 6 and 11 for more than 13 years on Channel 9, Ernie is truly one of the pioneers of local television news and sports and someone who makes “Our Town” the special place that it is to so many. We hope you have enjoyed this all new episode of Our Town with Andy Ockershausen and Ernie Baur. We invite you to listen to each new episode of Our Town as they roll out over the next several months. You can subscribe to the Our Town podcast on iTunes, Google Play, or if you complete the subscription form in the sidebar to the right, you will be notified by email when the next episode appears here on the website.